In stock -This product will ship today if ordered within the next 2 hours and 15 minutes. 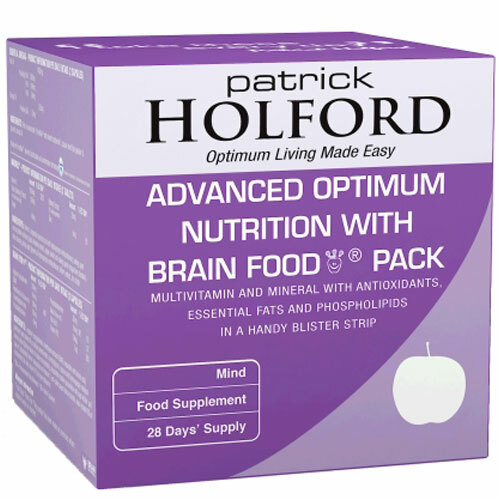 Advanced Optimum Nutrition with Brain Food is a potent combination supplement pack of vitamins, minerals, antioxidants, and essential fats providing comprehensive nutritional support for both body and brain function. Each day`s supply is presented in a convenient blister strip format to take with you when you are on the go. Each blister provides half a day`s supply of our Optimum Nutrition Formula advanced multivitamin formulation, the unique Essential Omegas, and potent antioxidant support provided by ImmuneC as well as Brain Food formula. The unique Brain Food Food formula contains vitamins, phospholipids and other nutrients to support the healthy functioning of the brain. It contains phosphatidylcholine and DMAE (nutrients that are used by the brain to make acetylcholine) along with phosphatidylserine and pyroglutamate. These are important nutrients for neurotransmitter reception, and work alongside vitamin B12, folic acid and pantothenic acid - essential for neurotransmitter production and balance. Lithothamnion Calcareum, Calcium Citrate, Calcium Ascorbate (Preparation with Hydroxypropyl Methylcellulose), Magnesium Oxide, Magnesium Citrate, Magnesium Ascorbate, Vitamin E (as D-Alpha Tocopheryl Succinate), Anti-Caking Agents (Magnesium Stearate, Stearic Acid & Silicon Dioxide), Pantothenic Acid (Vitamin B5 as Calcium Pantothenate), Niacin (Vitamin B3 as Nicotinamide), Iron (as Iron Citrate), Choline (as Bitartrate), Thiamine (Vitamin B1 as Thiamine Hydrochloride), Zinc (as Citrate), Riboflavin (Vitamin B2), Tablet Coating (Hydroxypropyl Methylcellulose), Vitamin B6 (as Pyridoxine Hydrochloride & Pyridoxyl-5-Phosphate), Vitamin A (as Acetate with Acacia Gum, DL Alpha Tocopherol, Sucrose & Tricalcium Phosphate), Inositol, Vitamin D (Preparation as Ergocalciferol with Maltodextrin, Hydroxypropyl Methylcellulose & Tocopherols), Manganese (as Citrate), Boron (as Sodium Borate), Biotin (Preparation with Dicalcium Phosphate), Selenium (Preparation as L-Selenomethionine with Dicalcium Phosphate), Iodine (Preparation as Potassium Iodide with Dicalcium Phosphate), Beta Carotene (Preparation with Alginate & Soya Protein), Vitamin B12 (Preparation as Cynaocobalamin with Dicalcium Phosphate), Folic Acid (Preparation with Dicalcium Phosphate), Vitamin K (Preparation with Acacia Gum & Sucrose), Chromium (as Picolinate), Copper (as Citrate), Molybdenum (as Sodium Molybdate). Fish Oil (PureMax), Capsule Shell (Fish Gelatin & Glycerol), Borage Oil, Mixed Tocopherols. Vitamin C Preparation (Ascorbic Acid with Hydroxypropyl Methylcellulose), Bulking Agent (Microcrystalline Cellulose), Black Elderberry Extract (Sambucus nigra), Ginger Powder (Zingiber officinalis), Anti-Caking Agents (Magnesium Stearate & Silicon Dioxide), Glazing Agent (Glycerine & Hydroxypropyl Methylcellulose), Bilberry Extract (Vaccinium myrtillus), Zinc Citrate. L-Arginine-L-Pyroglutamate, Pantothenic Acid (Vitamin B5 as Calcium Pantothenate), Trimethylglycine (Preparation with Silicon Dioxide), Capsule Shell (Hydroxypropyl Methylcellulose & Colours [Titanium Dioxide & Copper Chlorophyllin]), Phosphatidyl Choline (Preparation with Soya Lecithin), Phosphatidyl Serine (Preparation with Soya Lecithin), Anti-Caking Agent (Silicon Dioxide), Niacin (Vitamin B3 as Nicotinamide), Folic Acid. Take the contents of two blister strips daily with food, one strip with breakfast and one at lunchtime. Do not take if pregnant, planning a pregnancy or breastfeeding, unless on the advice of a doctor or antenatal clinic. Long term intake of amounts greater than 10mg of vitamin B6 daily may lead to mild tingling and numbness. Amounts greater than 1000mg of vitamin C daily may cause mild stomach upset in sensitive individuals. 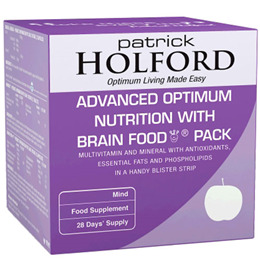 Below are reviews of Advanced Optimum Nutrition with Brain Food Pack by bodykind customers. If you have tried this product we'd love to hear what you think so please leave a review.